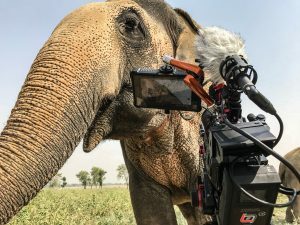 Shooting with Panasonic AU-EVA1 5.7K cinema cameras, Director of Photography Joe Callahan has completed principal photography on a feature-length documentary about wildlife rescue and rehabilitation in India. The documentary, aiming for premium festival berths, profiles the pioneering work of Wildlife SOS, a worldwide organization dedicated to protecting and conserving India’s natural heritage, forest, and wildlife wealth. Having purchased the EVA1s specifically for the wildlife project, Callahan has gone on to utilize the cameras for many high-profile commercial spots for GEICO, Alfa Romeo, Tide, Black & Decker, LensCrafters, and Alaska Airlines, among others. “When producer Erik Oberholtzer and I met with Nikki Sharp, who heads up Wildlife SOS’ U.S. office, and discussed the organization’s plans for upcoming animal rescues, we both felt this was a story that had to be told,” says Callahan. “I needed exactly the right cameras for what I knew would be an incredibly taxing shoot,” the DP continues. “What I look for in a camera is reliability, usability and image quality. The EVA1 is one of the top cameras I’ve ever evaluated in terms of color science and dynamic range, and I chose it over much more expensive options. The DP says he shot in 4K, recording ProRes HQ externally to an Atomos Shogun Inferno, with internal back-up to the EVA1’s SD cards. (ProRes HQ was chosen to avoid transcoding and make the footage direct-to-edit.) For lensing, he chose Tamron 24-70 and 70-200 G2 zooms, as well as a set of primes.